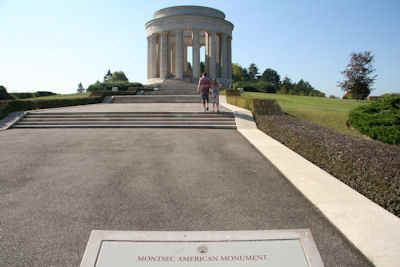 This monument has been erected by the United States of America to commemorate the capture of the St. Mihiel Salient by the troops of the First Army and to record the services of the American Expedionary Forces on the battle front in this region and elsewhere in Lorraine and Alsace. It stands as a lasting symbol of the friendship and co-operation between the French and American armies. The American First Army in its offensive operation of September 12-16, 1918 reduced the strongly fortified St. Mihiel salient, capturing 15,000 prisoners, 450 cannon and 700 square kilometres of territory.